You and this holster make an great team! Has a snap and velcro belt loop. Great for any width belts, even 2-1/2 wide belts. 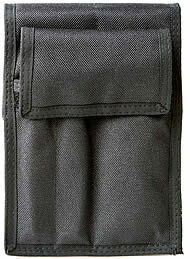 Made of water repellent black nylon heavy duty canvas material. Has a flap to cover scissors up to 5" or leave the flap open and keep up to 7" scissors in pockets.